BroaMan audio video network devices are fiber-based devices necessary for routing, converting and multiplexing media on a large scale. 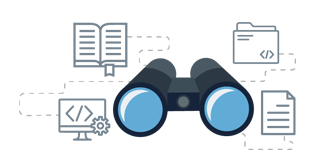 The devices transport all types of signals, including digital and analog video. BroaMan audio video network devices are fiber-based devices necessary for routing, converting and multiplexing media on a large scale. The devices transport all types of signals, including digital and analog video, digital and analog audio, digital and analog intercom and all forms of control data on copper and fiber infrastructure. BroaMan devices take advantage of Optocore and SANE technology to provide reliable and master engineered audio transport and routing solutions, however it is also able to integrate any other open or closed fiber transport protocol. The products are designed to transport 3G/HD/SD-SDI video, digital and analog audio, 4-wire and digital AES-based intercom, Ethernet, serial data (RS485/422), tri-/bi-level sync, Word Clock and many more. 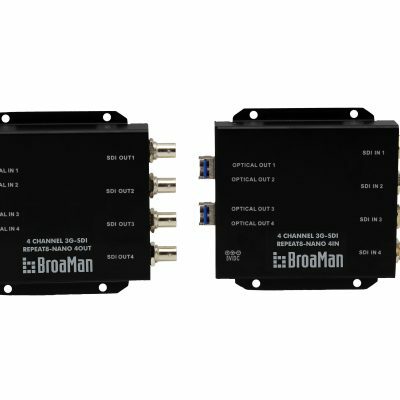 Designed to transport various signals over a single fiber cable, BroaMan audio video network devices help to simplify your workflow. Plug-and-play devices with no configuration required. Even if configuration is required to meet the specific needs on site, it can be done within one day, even for the most complex systems. Additionally BroaMan offers unique Automatic Routing which saves a lot of time when preparing a show. Changes requests are fast to execute and does not require a skilled and trained crew – which saves both time and the costs of a skilled engineer. Consumes less power than any other video network products with very efficient power supplies. Each device, even the most complex one, offering multiple channel routing, requires only around 20W of power. The large system consumes less power than a basic vacuum cleaner or, moving to the technical world, 10 times less than an Ethernet switch. Be the hero and ring in larger cost savings with BroaMan products. In mobile units or touring applications, gas and the loading volume are significant considerations. Designed in standard-sized 1RU chassis, each weighing between 3-5 kg, BroaMan is the ideal audio video network solution for live broadcast and live productions. Fiber interfaces that transport, route and distribute audio, video, intercom and control data over one fiber optic cable. Very low-latency, protocol-independent fiber interfaces that transport, route and distribute video with audio intercom and control data. Low-latency fiber repeaters that transport and distribute video and control data. 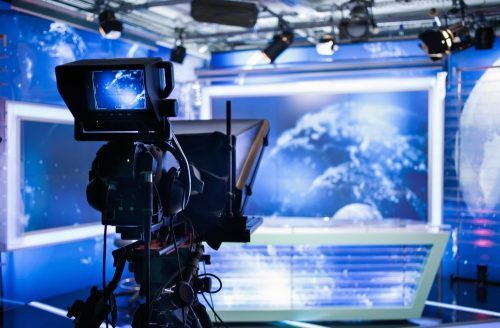 BroaMan provides HD/SD Video, Audio, Intercom, GPIO, data and LAN connections over a redundant fiber connections and is ideal for remote and studio broadcasts where media services are needed throughout a studio complex, stadium or concert hall. With fiber pairs video distribution between router and monitors, or from cameras to studio, together with intercom and audio program feeds can be sent between central equipment and the remote users and contributors. BroaMan provides for 3G/SD/HD Video, Analog audio, AES3, MADI and Intercom, so connections between Video Switchers, Audio Mixers, multi-media routers, monitor walls and loudspeakers and including intercom makes cabling much easier. With the Route66 AutoRouter, video signals from outlying MUX-22 units can be routed between studios under central control. The Repeat48 devices provide for conversion to fiber from electrical BNC systems and together with the Route66 provide a system solution for larger Broadcast campuses. BroaMan provides HD/SD Video, Audio, Intercom, GPIO, data and LAN connections over a redundant fiber connections and is ideal for venues where media services are needed throughout a stadium, sports complex, conference center or concert hall. With fiber pairs video distribution between router and monitors, or from cameras to studio, together with intercom and audio program feeds can be sent between central equipment and the remote users and contributors. BroaMan provides for 3G/SD/HD Video, Analog audio, AES3, MADI and Intercom, so connections between Video Switchers, Audio Mixers, multi-media routers, monitor walls and loudspeakers and including intercom makes cabling much easier. With the Route66 AutoRouter, video signals from outlying MUX-22 units can be routed between studios under central control. 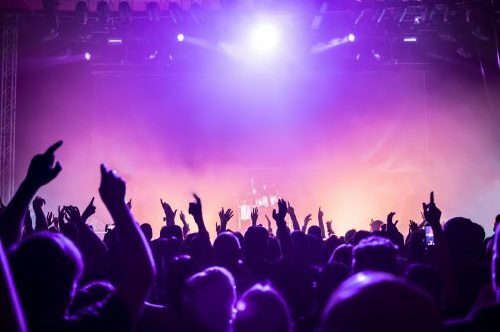 The Repeat48 devices provide for conversion to fiber from electrical BNC systems and together with the Route66 provide a system solution for larger venues or festival sites. 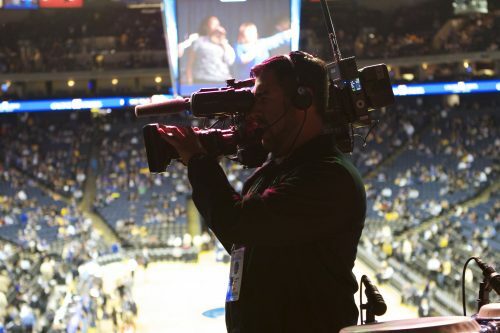 BroaMan provides HD/SD Video, Audio, Intercom, GPIO, data and LAN connections over a redundant fiber connections and is ideal for venues where media services are needed throughout a stadium or sports complex. With fiber pairs video distribution between router and monitors, or from cameras to studio, together with intercom and audio program feeds can be sent between central equipment and the remote users and contributors. BroaMan provides for 3G/SD/HD Video, Analog audio, AES3, MADI and Intercom, so connections between Video Switchers, Audio Mixers, multi-media routers, monitor walls and loudspeakers and including intercom makes cabling much easier. 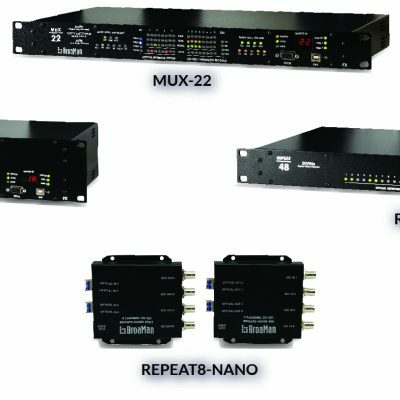 With the Route66 AutoRouter, video signals from outlying MUX-22 units can be routed between control studios under central control. The Repeat48 devices provide for conversion to fiber from electrical BNC systems and together with the Route66 provide a system solution for larger venues or sporting events. 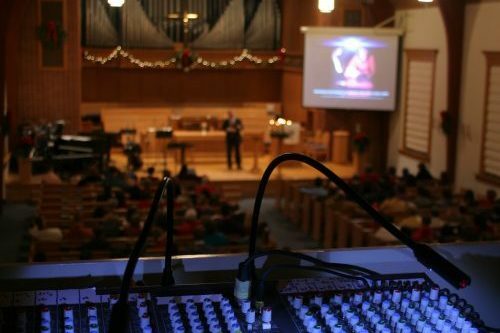 BroaMan provides HD/SD Video, Audio, Intercom, GPIO, data and LAN connections over a redundant fiber connections and is ideal for larger houses of worship where media services are needed throughout multiple technical areas. With fiber pairs video distribution between router and monitors, or from cameras to studio control room, together with intercom and audio program feeds can be sent between central equipment and the remote users and contributors. BroaMan provides for 3G/SD/HD Video, Analog audio, AES3, MADI and Intercom, so connections between Video Switchers, Audio Mixers, multi-media routers, monitor walls and loudspeakers and including intercom makes cabling much easier. 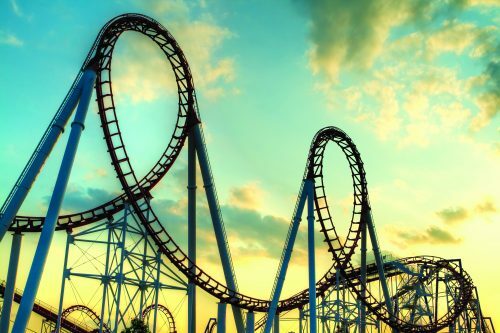 BroaMan provides HD/SD Video, Audio, Intercom, GPIO, data and LAN connections over a redundant fiber connections and is ideal for Theme parks where media services are needed throughout multiple technical areas, venues and parade areas. With fiber pairs video distribution between router and monitors, or from cameras to studio control room, together with intercom and audio program feeds can be sent between central equipment and the remote users, production crews and contributors. BroaMan provides for 3G/SD/HD Video, Analog audio, AES3, MADI and Intercom, so connections between Video Switchers, Audio Mixers, multi-media routers, monitor walls and loudspeakers and including intercom makes site cabling much easier.